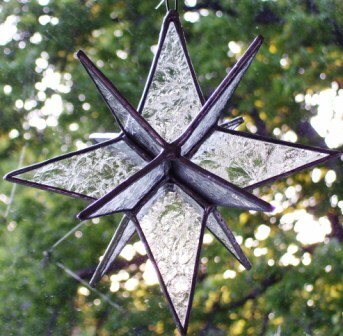 This entry was posted on June 18, 2007 at 1:40 pm and is filed under Copper Foil Method, Glue Chip Glass, Stained Glass, Stars, Straight Lines and Angles, Water Glass. You can follow any responses to this entry through the RSS 2.0 feed. You can leave a response, or trackback from your own site. Hi Susan. I’d be honored. Thanks for asking. These stars are beautiful. You’ve definitely got the form down on these! 🙂 I particularly like the blue one. I guess the word I would use is evocative. Reminds me of summer days. Awesome work. Tyler, Thank you so much! 🙂 At this very moment, I am posting photos of a red star I made this week. Mizzen says : I absolutely agree with this ! Where can I get a pattern? I do glass and have been looking for a challenge. I don’t hope to match yours, but I would like to try my hand at these!! I think you could match mine. I’m getting a little better with them each time I make a new one. I think it’s all just a matter of practice and learning what works best. My most recent one is way better than the first ones I made. My first ones had really thick seams, and I had difficulty in getting the points to fit together properly. The most recent one I made had thin seams, and the points matched nicely. I guess you just have to be really patient with yourself and try not to get in too much of a hurry. I have a single pattern piece that I use to cut my star points. I think cutting the points all the same size and grinding carefully (not too much) is part of the key to success. And, it seems that it works better if you just tack the pieces together before doing the seams. You can draw a star with 4 points, making sure they are all the same size. 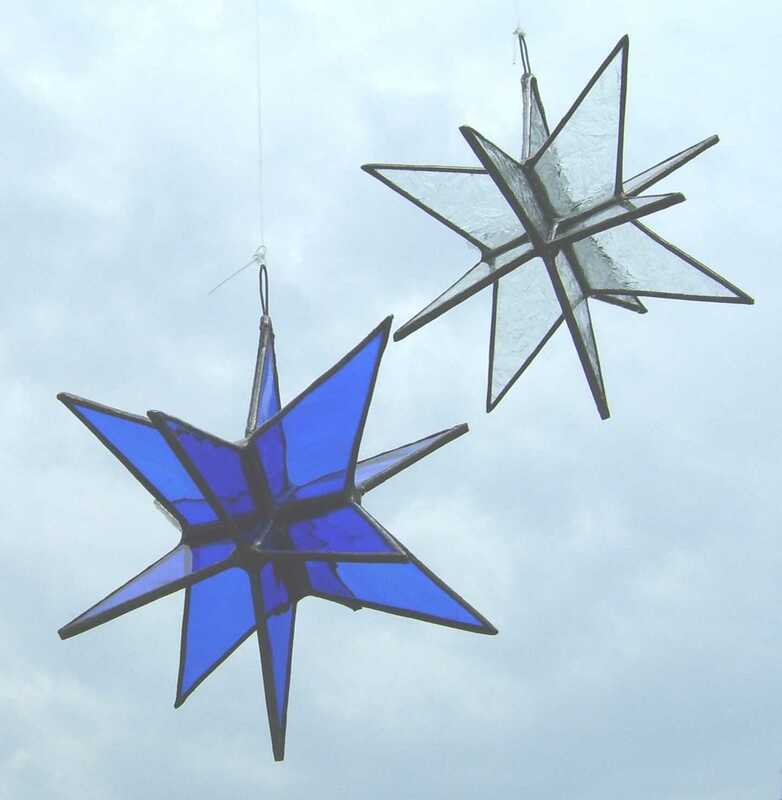 Then, you can use one of the pattern pieces to cut out the 12 points you need to make this star. I’ll try to post a photo of a pattern, too, but it will not be right away. I’ll need to figure out how to do it (photo of a pattern on paper? photo of 4 star pieces in a 4-point star?). When you put it together, you’ll make a flat, 4-point star. Then, you’ll add the 4 points on one side (all meeting in the middle). Then, you’ll turn it over and add the last 4 points. After it all, you can do the touch-up work (which takes me forever). The hardest part for me is to keep stopping. It is way too easy to try to get a seam just perfect and then over-heat the glass and crack it. I’ve done that on two stars this summer. 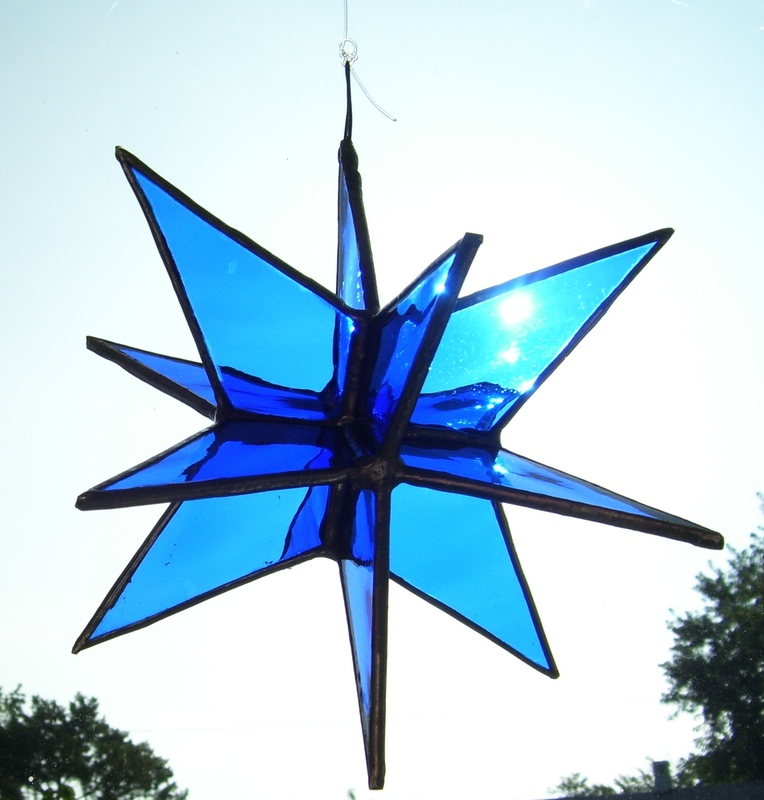 I have to have about three projects in front of me, just to keep alternatives available, so I won’t overheat the glass in the star. Anyway, I took pictures recently of the newest star. Now, I have to find the cable that links my digital camera to my computer, so I can upload it. It’s unusual with kind of a mix of purple, blue, rose and pearl (all in the same piece of glass).